Jack Thomas "J. T." Snow, Jr. (born February 26, 1968) is a former Major League Baseball player. He played all but two games in his career as a first baseman, and played nine of his 13½ seasons with the San Francisco Giants. He was known for his exceptional defense, even though he was a very poor defender according to most advanced defensive metrics. After his retirement as a player, Snow worked in radio and television broadcasting. He is now a special assistant to the general manager for the Giants. Snow attended Los Alamitos High School in Los Alamitos, California and played baseball and football and basketball with future teammate Robb Nen. After high school, Snow played three seasons at the University of Arizona, where his teammates included Scott Erickson, Trevor Hoffman and Kevin Long. Traded to the California Angels that year as part of the Jim Abbott deal, Snow played for them from 1993 to 1996 where he won his first two of what would be six career Gold Gloves. He was traded to the Giants after the 1996 season for left-handed pitcher Allen Watson and minor league pitcher Fausto Macey. 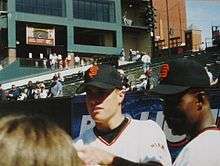 In the 2002 World Series, Snow was scoring a run in Game 5 off a Kenny Lofton triple and lifted 3-year-old Darren Baker, the Giant's' batboy and son of then Giants’ manager Dusty Baker, by the jacket as he was crossing home plate. Darren had run out to collect Lofton's bat before the play was completed. This turned into a touching and memorable incident, but easily could have resulted in disaster with a small child wandering into the path of Snow and David Bell as they both barreled home to score. Following the incident with Darren Baker, Major League Baseball required batboys and girls to be at least 14 years of age. A photograph of this incident now hangs in the Baseball Hall of Fame, in Cooperstown, New York. At the end of the 2006 season, Snow retired from baseball and began working as a color commentator on Giants radio broadcasts alongside play-by-play announcer Dave Flemming. He also serves as an advisor to the Giants' general manager, Brian Sabean, and as a roving minor league instructor for the Giants. On September 24, 2008, the Giants signed Snow to a one-day contract to allow him to retire as a Giant. However, rather than immediately retiring after signing the symbolic contract and receiving no actual pay as is usually done, Snow was penciled into the starting lineup and took the field on September 27 against the Dodgers, but was replaced before the first pitch. It was a move that allowed Snow to officially take the field as a Giants player one last time. Eugenio Vélez, Omar Vizquel, and Rich Aurilia threw balls in the dirt to mess with Snow during fielding practice prior to the first pitch, but Snow still made the plays. For his brief official appearance, he received the prorated league minimum salary of $2100. ↑ "J. T. Snow Statistics and History". baseball-reference.com. Archived from the original on 2014-10-17. Retrieved 2014-10-17. ↑ "J.T. Snow - Statistics - Batting". fangraphs.com. Archived from the original on 2014-10-17. Retrieved 2014-10-17. ↑ "San Francisco Giants: Front Office". sanfrancisco.giants.mlb.com. Archived from the original on 2014-10-17. Retrieved 2014-10-17. ↑ "MLB sets minimum age of 14 for batboys". Sports Illustrated. January 16, 2003. Retrieved 2012-07-28.